V.501 "Kalidja La Danseuse Tunisienne"
In all the years of Pathé-Baby and Pathéscope and the 9.5mm home movie gauge, one of the biggest drawbacks was the lack of printed colour films. In my youth I looked with envy at printed films in colour on 8mm and 16mm. A few Walton releases were pretty well the sum total available to ninefive enthusiasts in the UK. 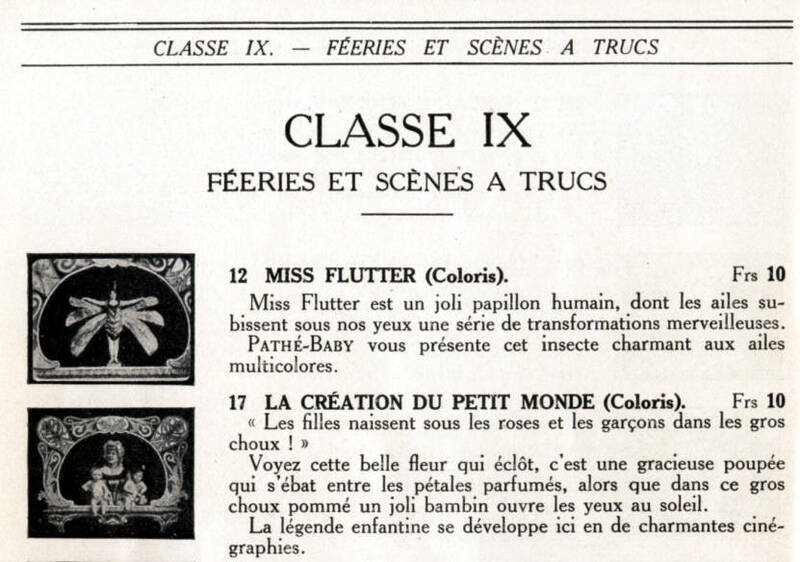 Why then in the second ever French Pathé-Baby film catalogue issued in October 1923 (a huge illustrated descriptive catalogue of 72 pages listing over 450 of the little 30ft/9m titles!) are a number of titles listed as 'Coloris'? Well these short films in little cassettes with the silver printed black title bands were coloured - not actually filmed in colour but printed by the Pathé stencil colour process. 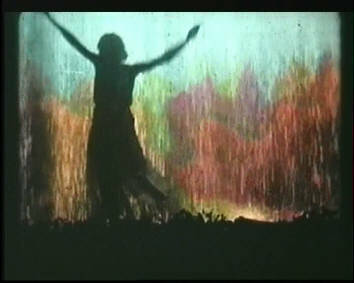 The Pathécolor process was introduced in 1905 for 35mm cinema releases and used up to the early 1930's. 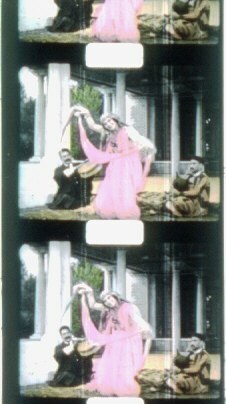 Originally used for colouring picture postcards, the process involved cutting a number of stencils, one for each colour required, to match a positive print of the film. The stencil films were then run in contact with each new print through staining machines which applied suitable dyes to the stencils using an endless loop of velvet ribbon charged with dye by a rotating brush. Each new print had to pass through as many stencil dye machines as there were colours. Preparation of each stencil for a film release originally involved an operator actually hand cutting every frame of each stencil using a scalpel! Later the process was mechanised, the operator moving a pointer over a screen where the film was back-projected. 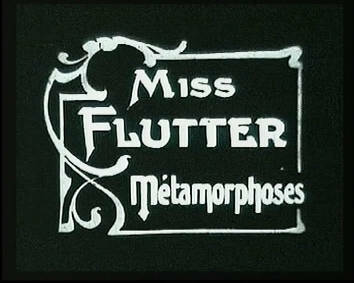 A pantograph mechanism reduced the movement to the scale of the film and a vibrating cutting needle cut the actual stencil outline. It took an hour to cut a metre of stencil film! The accuracy required must have been very high even for 35mm images, but to achieve good results for 9.5mm is amazing. It could hardly have been economic even for the 30ft shorts, and they soon disappeared from the catalogues, making them a rare and exciting find for collectors. Here is a list of all the titles I have traced (maybe more?). In 1923 (France) the 9.5mm Pathé-Baby 30ft black & white titles cost 5 or 6 francs each, whilst the coloured releases cost 10 francs. 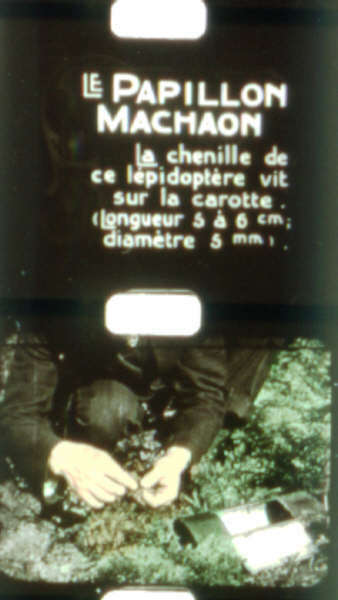 The 9.5mm Pathé-Baby stencil colour films were only ever issued with French titles - the titles incidentally were not coloured but always printed as black and white. Girls are born under roses & boys under cabbages! Pathé 'slow cinema' shows you the opening of this pretty flower. Children's scenes - NOT in 1923 Pathé-Baby catalogue - issued later. Uncle has a beautiful siesta after lunch, he's not prepared for Regine's frolics! 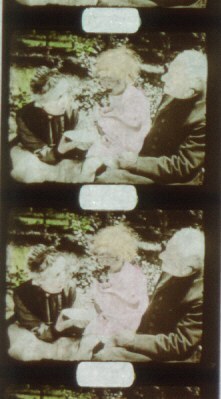 Pathé-Baby shows phases of its metamorphosis. This ferocious reptile can sever an arm with one bite. These plants, indigenous to the garden, are objects of superstition. Admire movements by the sons of Mars. Pathé takes you to this terrestial paradise, under a blue sky. 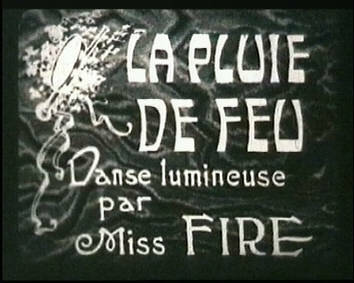 Artist O'Galop animates the La Fontaine fable. 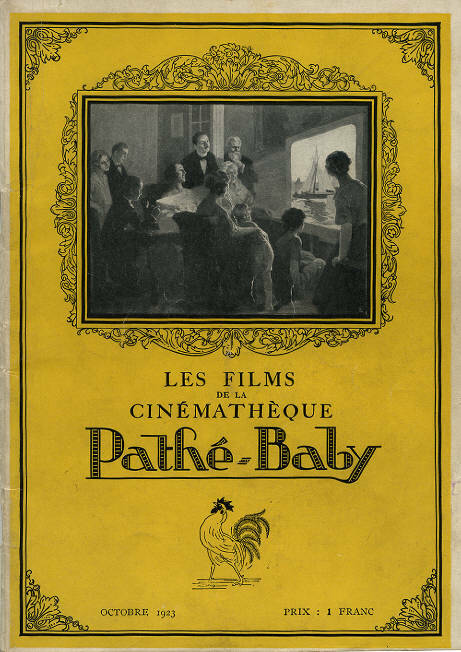 NOT in 1923 Pathé-Baby catalogue - Early O'Galop animation film from about 1910. Its golden beach, blue waves, sumptious hotels and casino. Framed with veils, adorned with jewels, a charming vision. These gorges are one of the great curiosities of France. Many charming creations, presented by elegant models. A magnificent beach of fine golden sand. Pearl of the coast. (The descriptions are abbreviated from the Pathé-Baby catalogue). Is this yet another first for 9.5mm? Coloured package movies on sale in 1923! Unfortunately I have yet to own any of these treasures, but live in hope! [Since this article in 1994 for the Group 9.5 magazine, another title turned up - number 424. Making 20 titles in total. Still available in 2018! 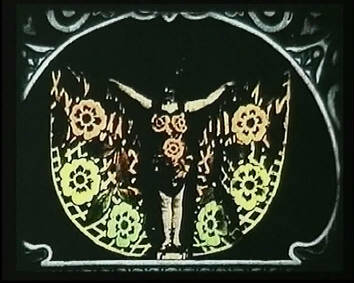 - DVD "9.5mm STENCIL COLOUR FILMS"
includes all 20 of these interesting, rare films with suitable background music.